STRYPER will enter the studio this fall to begin work on in its new album for an early 2018 release. Frontman Michael Sweet told Good Company in a new interview about the band's planned follow-up to 2015's "Fallen" (see video below): "We're gonna start recording a new album in October — we start pre-production — and we'll probably be done by before Christmastime, at the latest just after Christmas. It will come out — if I had to guess — probably around April." Asked if he feels any pressure having to come up with an album's worth of material in such a short period of time, Sweet said: "I do, but I don't [start writing well ahead of time], actually. I procrastinate a lot. So if I'm traveling and I'm busy doing other things, I'll put off [until] two, three weeks before the album writing the album. I've done that on the last three albums — 'No More Hell To Pay' , 'Fallen' and [2016 solo disc] 'One Sided War'. Those were all written just a few weeks before recording. It's not the way I like to do things, it's not the way things should be done, but I seem to be — for whatever reason — in that mindset. And hopefully for this new STRYPER album, I can break that. I wanna start writing in July, 'cause I'm gonna have some time to do that, and try to come up with a good number of ideas long before we start recording them." 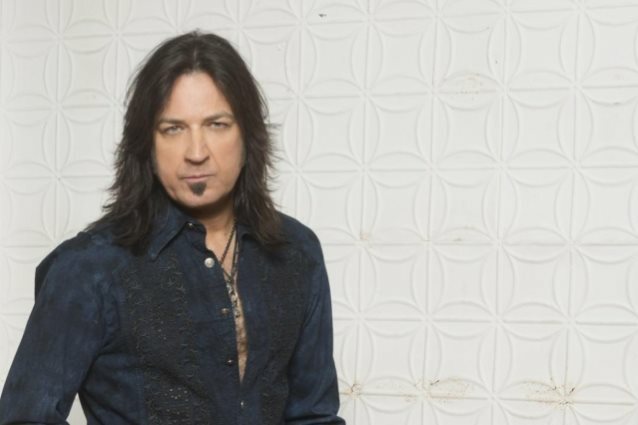 STRYPER guitarist Oz Fox recently revealed that Tim Gaines was going through a divorce, forcing the band to take a hiatus and possibly consider a future without the bassist. "As far as I know, [Tim is] looking like he's on his way to making all of that stuff in his life correct and fixed, and then we'll see where he stands after he's all done with that, and I know he wants to keep touring," Fox told The Vinyl Mishappenings. Michael told the WSOU radio station that STRYPER has "no plans of stopping," despite the latest setback. He explained: "I mean, we had considered it and thought, well, maybe we should, but then we realized, well, that's just fair to us, that's not fair to the fans. So we're gonna continue on for sure." Sweet also said that it was "probable" that STRYPER would carry on without Gaines, explaining that "if we were to disband or dissolve or stop, it really wouldn't be fair to the fans, it wouldn't be fair to the other guys, and it's important to keep that in mind as well." Gaines is no longer listed as a member of STRYPER on the band's official web site. "Fallen" entered The Billboard 200 chart at position No. 43 with first-week sales of just over 10,000 units — nearly all from pure album sales. The set followed the No. 35-peaking "No More Hell To Pay", which was released in 2013.